We are thrilled to announce that the Garbage Gobbler has been re-imagined and re-introduced to a handful of rest areas across the province as part of our Rest Area Improvement Program. 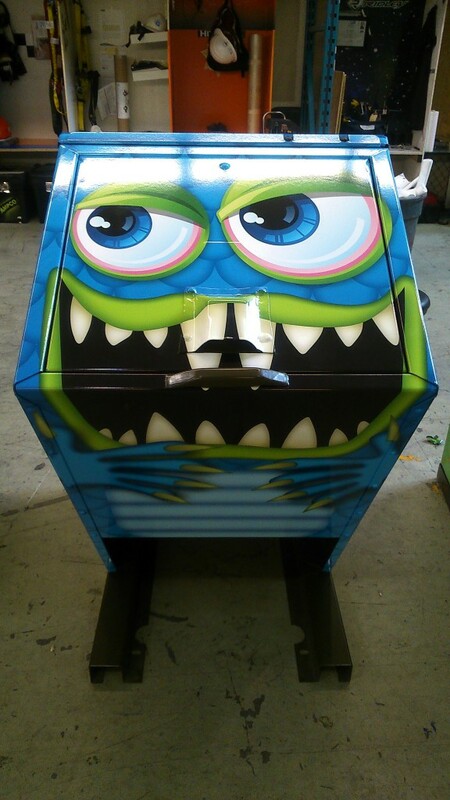 A total of ten bear proof bins have been wrapped in our new gobbler design. We thought long and hard about what these new gobblers should look like. Should we give a nod to the historical retro look or break new ground? Should we build new bins for the gobblers or use our bear proof bins? In the end we decided to go with a modern look and to incorporate today’s environmental needs, such as keeping wildlife out of the bins and providing travellers with recycling options (two of the ten bins are blue gobblers, letting you know that those special gobblers are hungry for plastic and aluminum). You probably already know that rest areas are an important part of our highway system (they help improve highway safety by reducing accidents due to driver fatigue). 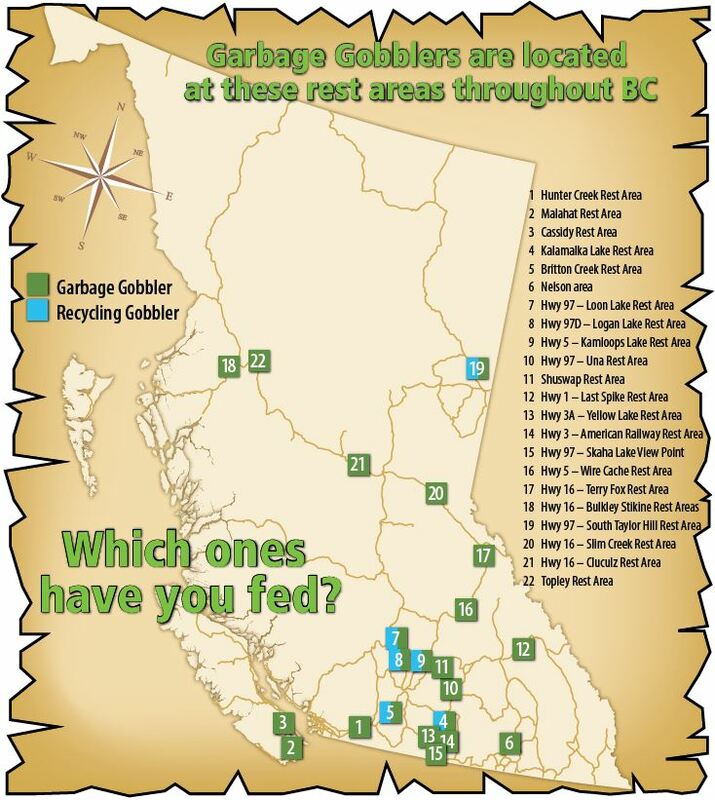 By bringing the Garbage Gobbler back to our rest areas, we hope you will remember that rest areas are more than a place to stop and recharge while travelling, they are also a great place to plan your adventures, enjoy beautiful British Columbia and have a bit of fun with your friends and family as you feed the gobbler. So, take a break and feed the Gobbler! We think you’ll be glad you did. And don’t forget to tell us what you think – using the #garbagegobbler hashtag, or by connecting with us on Facebook, Twitter or in the comments below. If we receive enough positive feedback, more gobblers might find a home at a rest area near you! Thanks for letting us know that you appreciate our garbage gobblers! 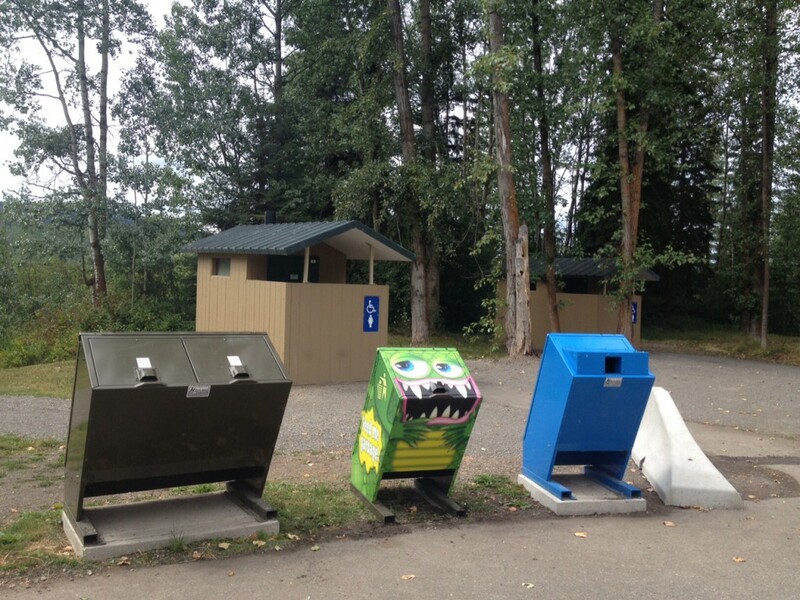 I’ll forward your creative suggestions about “Compost Critters” and a “Recycling Rabbit” to our people who manage BC Rest Areas along our highways. They would need to consider the costs of manufacturing and installing any new “rest area animals” among their budget priorities for rest area and highway maintenance. Now if we could work on decent tp at the outhouses, I keep a spare roll in my emergency kit in a tobacco tin (waterproof). We have had our “litter bug” for three years now. I was working for Kokanee Creek Provincial park and there was one in our maintenance yard tucked away behind one of the buildings. When the park changed hands I asked if I could purchase it because of my husbands fond memories of it as a child. We need to bring it back to it’s original state but we use it as a recycling bin. 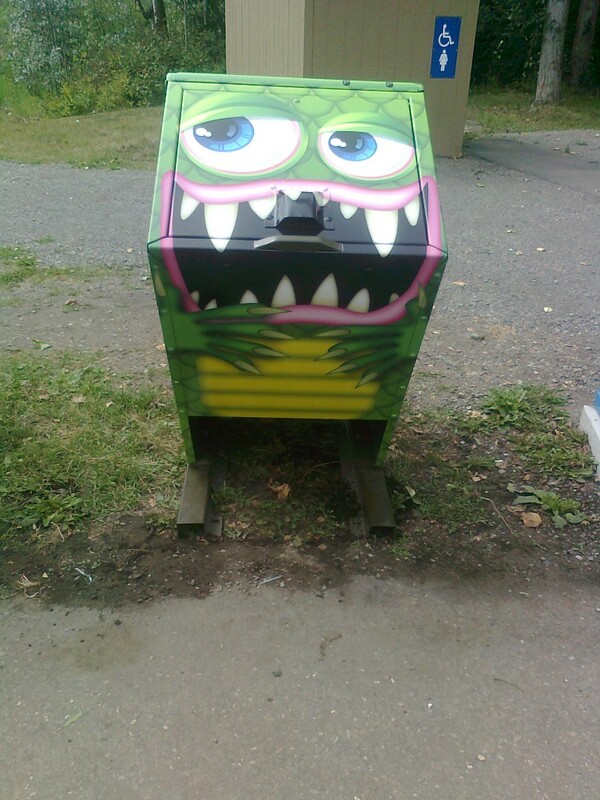 I am from Ontario originally and just found out it is called a Garbage Gobbler. The best purchase ever for two bottles of Okanogan wine. Thanks for sharing with us and letting us know about your special treasure! Wow! Thats a huge win! Good for you both! Hope more will make appearances ! Perhaps even in BC Parks and Forest Rec. Sites ! There’s an original vintage Garbage Gobbler still on duty at Ashcroft Manor on Highway 1 west of the Ashcroft turnoff. Wow this is great! I worked in BC Parks in the ’60s to 90’s and lamented the loss of the gobblers. My favorite was the top of Anarchist Hill out of Osoyoos. Well anyway, I think the return of the gobbler is one of the best ideas you have had in a long time. As well as this website. Please install more! So glad to hear you like them Alan! Thanks for the feedback – any where in particular you would like to see one? Any chance of rounding up a few of the stray originals and preserving them, as at Revelstoke (works yard on Hwy 23 just south of town)? There really aren’t that many left. The only other one I’m aware of is at the Vernon District Office. I’ll do some digging. Thanks for the head’s up Brad – wonder if we could get them to send us a pic? Yes, I’ll get one this week, you can almost see it on street view from Hwy 97 but it’s looking into their yard, since that photo, it’s been turned to look out at the highway. Just sent you a message Brad – thanks again.